Being present on emerging markets at the right moment is a key factor for companies’ success. 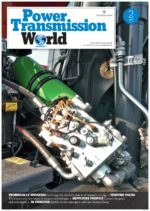 In order to meet this need, shared both by SMEs and by big-sized companies, Tecniche Nuove decided to increase its visibility abroad through the publication of Power Transmission World. It is an online magazine in English addressed to the world’s machinery and plant manufacturers who purchase industrial components for mechanical and fluidic power transmission. Characterized by great international reach, Power Transmission World devotes attention also to Italian components manufacturers and allows them to introduce the best of their products on foreign markets. I would like to subscribe to your publication, and possibly advertise in this. I would like to receive a sample of your magazine to see if this would be a good fit. I thank you for your interesting in our magazine. Our Sales Agents will contact you for any requirements. Hello, We need the media pack 2017 if possible. we are glad to know you appreciated the content of Power Transmission World. Our Sales Department will send you the required Media Kit 2017. I thank you for appreciating the content of Power Transmission World. You will receive the Media Kit 2018 by our Sales Advertisin g Department. our Sales Agent Barbara Allocchio will send you the Media Pack 2018-2019 asap.